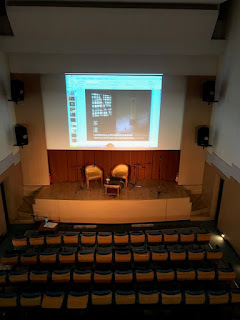 This time things discovered a hole in the time fabric and I found myself in a 1950 style auditorium, equipped with a barely surviving PA system and manned by an incredibly warm hearted personnel to whom I will always be grateful for guiding me through the ad-hoc learning of the technology. 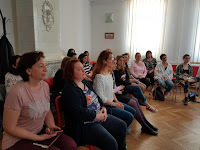 With a smile on their faces and a warm cup of tea at the end, they surrounded me with friendship explaining what they believed was an error in the heating system, as the hall was a freezing trap somewhere, away from dusty, humid and very warm atmosphere of the streets of Bucharest on April 19, 2018. 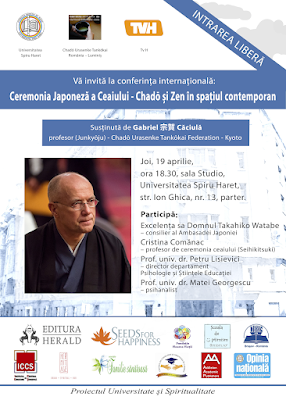 I was at the STUDIO hall of the Spiru Haret University, in the centre of the centre of Bucharest, where I was invited to discuss about Chadō and Zen (two topics one should not easily dare talk about in public) thanks to the kindness of the management and in particular the willingness of a man of vision who happens now to be a good friend, doctor Matei Georgescu - professor at the department of the Science of Education and Psychology. Dr. Matei Georgescu fights to bring back perennial values into the mainstream educational curricula. The injection of "specialisation" without the injection of basic human values tends to destroy the fabric of society. And we do not want that don't we? Materialistic values, competition, quick fixes, the race for efficiency lead all to alienation. Ignoring the food that makes man be human and the human remain human - the exercise of the humanistic instinct and of the ability to appreciate, study and continuously grow the aesthetic and ethic values fundamental to our civilisation, leads us to nowhere. 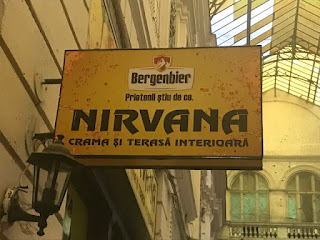 Talking about spiritual values, today, when even the word "spirituality" became a confusing abstraction, used anywhere, from a lavatory, to a disco, to a menu of a new age restaurant, is either an impossible task or a task that has to be undertaken with a clean sense of humour and respect. We chose the second option. 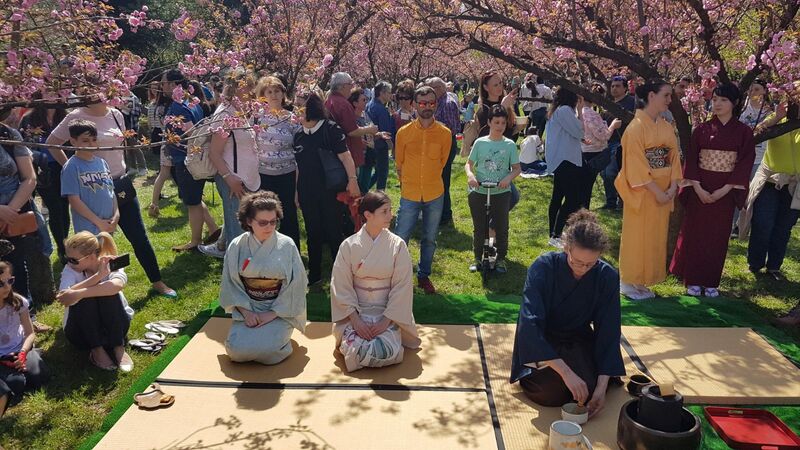 Chadō (the Way of Tea), and Chanoyū (the Japanese Tea Ceremony), are about the heart and spirit of the Japanese people. Zen, the forever elusive and undefinable teaching, is the spiritual backbone of this Tea Ceremony and is a key ingredient in the fabric of the Japanese soul. Or so it was hundreds of years ago. The key element here, and the purpose of the conference, was to walk, together with the audience, through the formation and the evolution of this spiritual backbone and to ask ourselves whether the values are today obsolete or just forgotten. 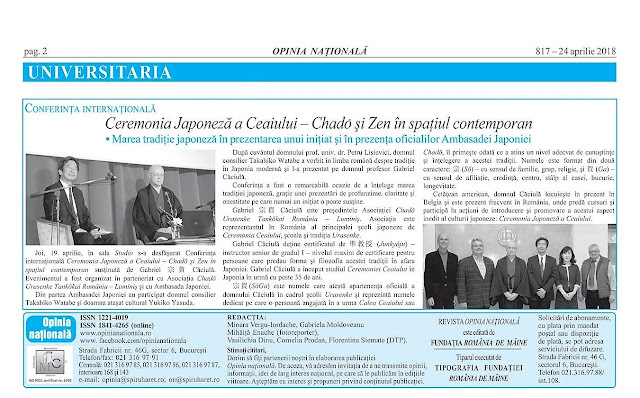 Whether the missing link which many of us feel inside, the seed of anxiety, the fabric of depression, is due to the fact that, while the values present in Chadō and Zen, are perennial, permanently next to us, human beings, we forgot about them, we do not know they can be resurrected, they can again be our friends. Become again our friends, because while imbibing the morality of a Japan of the XVI century, they transcend the Japanese culture as they represent fundamental human values even today. The poster, an enthusiastic impromptu of poster art, included all the information possible - nothing was left out. 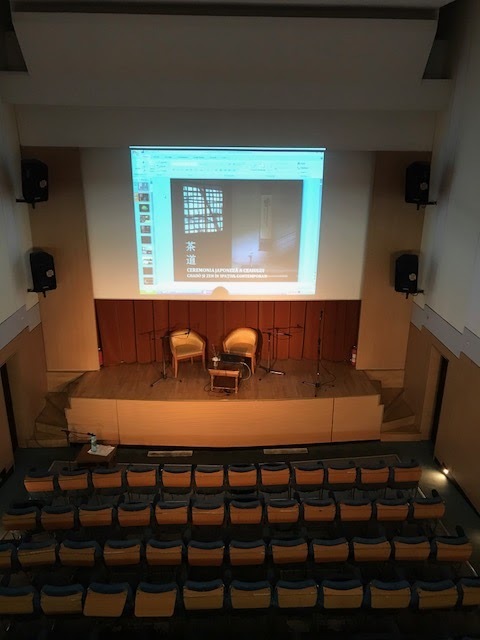 The hall, few moments earlier empty and cold, filled with people who brought their warm feelings and curiosity. Not many people - you do not know what to make of such a title for a conference: Chadō and Zen today. But they warmed up the space with their sincerity and curiosity. A good bunch of people who joined the speaker in a genuine debate. The Embassy of Japan, was always supportive of such cultural activities. 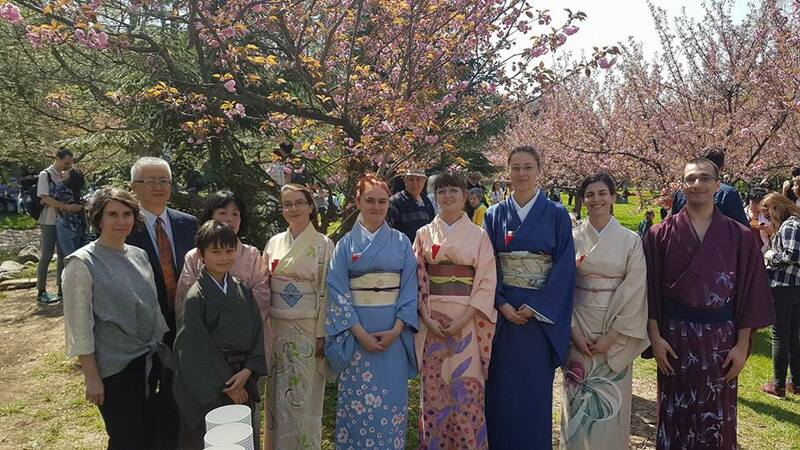 Ms. Yukiko Yasuda - cultural attache and Mr. Takahiko Watabe - counselor / advisor to the Embassy of Japan honoured us with their presence. 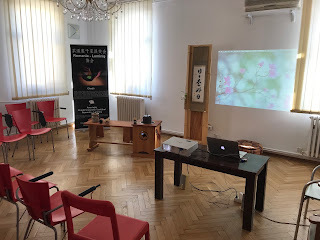 Mr. Takahiko Watabe offered an eloquent and well focused introduction to the role of the Tea Ceremony in Japan, underlined the importance of such activities and introduced the speaker. A formal photo session took place prior to the start of the conference. Sharing cultural values and trying to understand their dimensions, their true meaning, beyond instinctive immediate associations, is a key factor for a good cooperation and expansion of our cultural space. We look forward for more such encounters. MINDFULNESS, a quasi untranslatable word (no wonder, as it has a quasi untranslatable meaning - could anyone imagine the MIND flattering itself, who would be the "flattered", who would be the "flatterer"? ) is the darling of the community of dreamers about the "DREAM" - growing larger and larger today, as the society grows weirder and weirder. MINDFULNESS is the buzzword of today, replacing YOGA, MANAGEMENT, KARATE, FENG-SHUI, WASABI, ZEN-SUSHI, ZEN-SPAs and other attractors like these. And, to drive all of us nuts, MINDFULNESS had a pretty noble origin and a very serious intention. The intention of no one else but Mr. Buddha, many years back, was to structure and format a prescriptive WAY for those who like him, were searching for the Impossible, but lacked the good luck! A WAY to let all of us, hit by the thunderbolt of the Enlightenment, transgress somehow the world of Dualism, of the Subject - Object epistemological dilemma, and finally come to terms with ourselves realising that Impermanence is nothing but Impermanence and this is not too bad at all, as it is what it is. To do that requires some sort of discipline and codes, lots of codes of prescriptive moral and ethical demeanour, the resources (internal and external) for dealing with RIGHT and WRONG. And of course the discipline NOT to LAUGH as in the end both right and wrong stop making sense or anything else. All started with the commentaries and the texts interpreting the Divine Revelation of the Vedas and the Dharma. In these texts there was a MUST: always remember the Dharma. But how? Well, Buddha pointed out to the Suffering as the source of all evils. The source of the Suffering was the Ignorance and Buddha passed the Mandate to control it and a Path to defy it: the Eight folded Path. 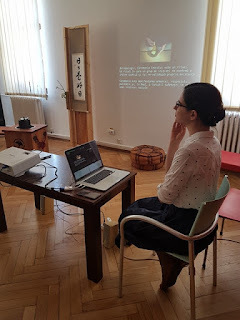 Among the eight Commands - The Correct Attention, (Samma Sati), at the end of and endless train of translations and interpretations known today as MINDFULNESS. The whole point is that the Path must be complete. Practicing MINDFULNESS alone, whatever resolution the meaning of the word brings to people's MIND, is a NO STARTER. It is like starting to build the house with the roof. But the today's community of SPA owners, HEALING aficionados, shrink gurus and management consultants have a different opinion. The Spectre of the Palliative is here with us to stay. There is, a placebo effect. People do benefit sometimes from the effects of applied MINDFULNESS. This perhaps because there are also clever psychologists. In the end, a side effect: there is money to be made and people to be brainwashed happy. Buddhism, Zen and Chadō are among those paradigms who provide a healthy space for the true practice of the eight folded path. Not only them. But they all point out to discipline and effort. A quick fix - the MUST of today, is not on their list. 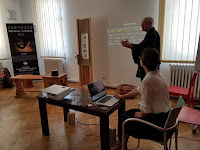 The endlessly curious and eager to disseminate culture staff at the Calea Victoriei Foundation decided that an open discussion on this matter may a profitable humanistic and spiritual experience for their public. And it was. On April 14, on a splendid spring day, our Urasenke Tankokai Romania - Luminis Association presented a conference on the TEA CEREMONY, ZEN and MINDFULNESS followed by the ceremonial serving of a cup of tea for the public. An interactive, intense and enriching experience. 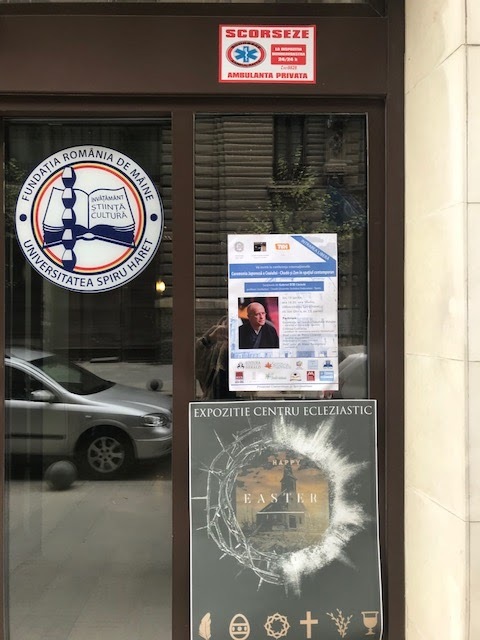 Our sincere thanks to the Calea Victoriei Foundation for their amazing role in maintaining Culture on the pedestal on which it was always meant to stay. The discussions unveil a public eager to know, to ask, to challenge, to smile, to critique, to exist. When we all conclude that MINDFULNESS is of great support when correctly understood and applied as a part of a whole and not as a separate quick fix, it is time to prove it: a good cup of tea will do it! Many thanks to Alina, Cristina, Elena and Miha for their elegant presence and professional serving of the tea. 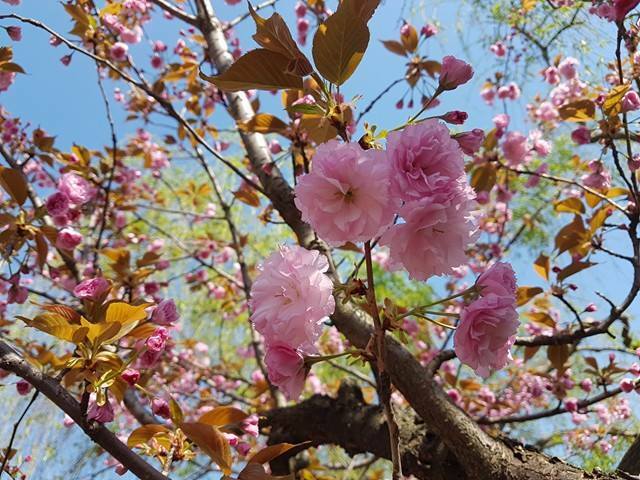 Hanami (花見), translated in English as flower viewing, is one of the most awaited events in Japan and not only. This has been the tradition for a long time of welcoming and appreciating spring. What people usually do is to gather around the cherry blossom trees and have a picnic in which they enjoy food, drinks and of course sakura. 14th of April was the perfect day to enjoy sakura trees in the Japanese Garden from King Michael I Park which was also the day when the Japanese Garden opened the first time after its restoration. 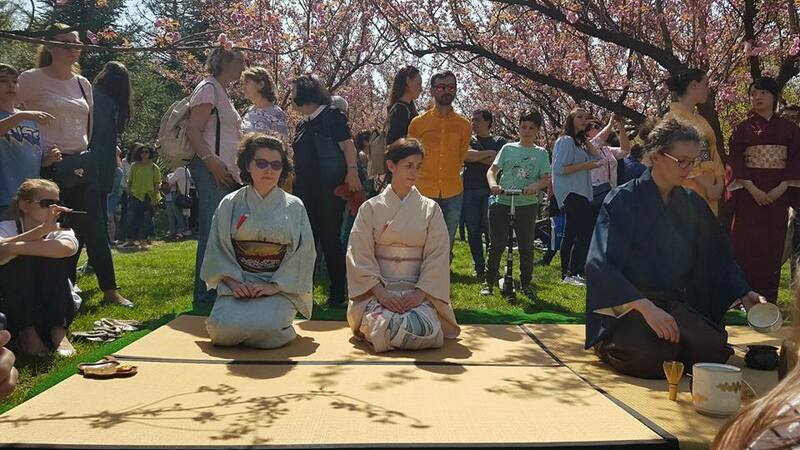 Since sakura goes so well with tea, the Japanese Embassy gave us and our colleagues from Urasenke Tankokai Romania Association the opportunity to do tea for more than 300 guests. It was a fruitful happy tea day.